On Thursday, April 12th, the Honorable Arthur A. Garcia swore in 9 community members as CASA volunteers—court-appointed special advocates for abused and neglected children. 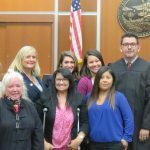 The newly appointed CASA volunteers join 179 other dedicated community members who have been trained and are advocating for foster children in the county’s juvenile dependency court system. As officers of the court, they ensure that the children’s needs are recognized and best interests are considered both in the courtroom and in the community. CASA volunteers are asked to meet with the child weekly and are authorized to interview people in the child’s life such as social workers, attorneys, and teachers. They attend court hearings with the child and report their findings to the judge. 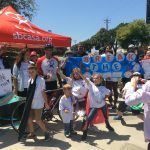 CASA of Santa Barbara County is working towards the goal of serving every child in need, something only a few CASA programs nationwide have been able to achieve. There are no prerequisites for becoming a CASA volunteer other than being at least 21 years of age, clearing an extensive background screening and successfully completing 30 hours of training. The next advocate training session begins April 30th in Santa Maria. If you are interested in learning more about becoming a CASA volunteer and the rewards that come along with serving as the voice of a child, please contact CASA at volunteer@sbcasa.org or call 739-9102 ext 2594.